In a Doomsday Survival scenario, if you had this solar oven with you, you would always be able to cook and in many cases you would also be able to boil water or pasteurize water. Sunflair sells a water pasteurization indicator (WAPI) that will tell you when the water is pasteurized. (This is included in the above pictured set, and is linked below to purchase separately). Think about it. This oven gives off no smoke and you can do other things while your meal is cooking instead of tending a fire. A UV index of 4+ is best for solar cooking. 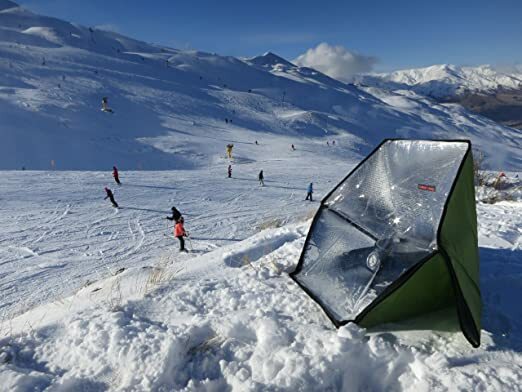 The Sunflair Portable Solar Oven can reach temperatures of up to 285 F and is highly portable folding down to the size of a seat cushion and weighing just over 2 lbs. This set comes with everything you need to get cooking: 1 solar oven, 2 collapsible silicone pots, 1 baking-dehydrating rack, 1 heat conducting-baking tray, 1 solar oven thermometer, 1 carrying bag, and is made with state-of-the-art closed cell insulation. Temperature varies depending on season and location. Four-season cooking below 40 degrees latitude and three-season above. The parallel 40° north forms the boundary between the states of Kansas and Nebraska. The Sunflair Portable Solar Oven ranks #2 in our Top Ten Best Portable Solar Panels & Solar-Powered Products list. "I have used the sunflair here in central Wyoming in January with a temp of 20F and no wind. It did steaks and onions just fine. The cooking pots that came with it heated up nicely." "This oven is great. I was skeptical but was impressed that food actually cooked. The food was very tasty. I am pleased with my purchase. i don't have to heat up my kitchen on a hot sunny day. Works best on sunny days I love it, dehydrates food too." "I purchased this solar cooker just to test it out. I was not expecting much but the storage and portability made it worth checking out. I do a lot of solar cooking and own quite a few nice solar cookers. This one was a real surprise. It performed much better than I expected and is now a regular. It is so easy to pack up and carry in a small vehicle. The collapsible pots are easy to use and clean up. I have purchased a few more for Christmas gifts." "Very little effort tracking the sun - Cooked my roast and vegetables to perfection! Great back up for emergencies or to use while camping." "Love it! As long as you realize it is going to take you longer than a conventional oven, it works great to cook just about anything! It seems very durable, so I think it will last a long time. It is very simple to use also." "So wonderful. I made chicken enchilada soup on a sunny 50 degree day. It worked as promised and tasted great!! Wonderful idea." "A Must Have! The Deluxe Sunflair kit is a must have! I do a lot of traveling. I love how the oven folds down and is so light weight. I cook everything from delicious gourmet dishes to on the road quick meals. Everything cooks beautifully. Using the second baking tray as a cover helps to brown and crisp fish sticks, pizza dough, nuts, and etc. The first few times using it, I'd recommend a day of full sun to get the hang of it, but it is so easy to use and I use it on partly cloudy days. I find it easier to use then my kitchen oven, and definitely easier and safer then a BBQ or camp stove. My favorite thing is, that once the oven and food is started and hot inside, I can leave it unattended for a hours by over tracking the sun's path across the sky. That allows me the freedom to do other things. I haven't done the math, but I'm sure it paid for it's self in the first 1or 2 months with the sun's free energy!" If it is very windy, you may need to put bricks or rocks inside on the corners to help keep it from blowing over. The following YouTube video is a review and demonstration of the Sunflair Portable Solar Oven with Complete Cookware and Thermometer. The following YouTube video is another review and demonstration of the Sunflair Portable Solar Oven with Complete Cookware and Thermometer. 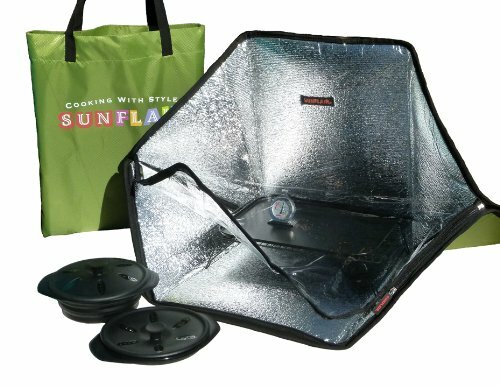 Sunflair Portable Solar Oven Starter Kit (This is the same model as pictured above but without the cookware. Use your own cookware and save money). Sunflair Portable Solar Oven Deluxe with Complete Cookware, Dehydrating Racks, and Thermometer (This is the larger deluxe model).